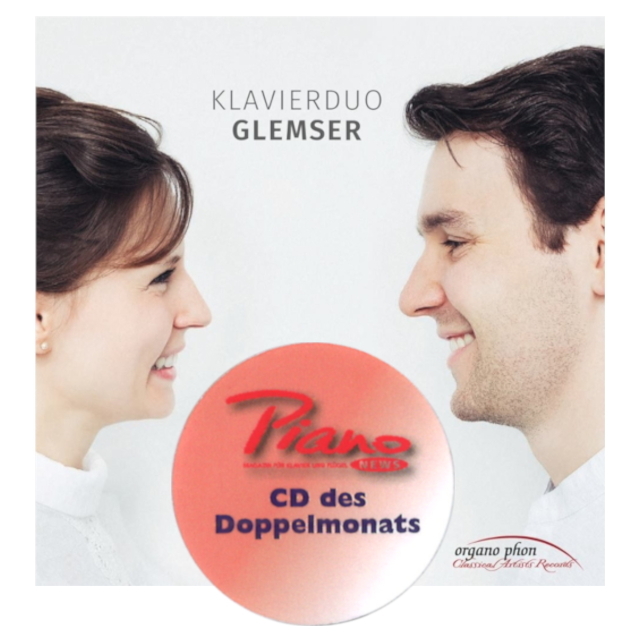 The debut CD of the piano duo Glemser has been released on the label organo phon and is available now. For their first recording, the young couple selected works by Mozart, Tchaikovsky and Saint-Saens. A repertoire in which the artistry of piano duo playing is taken to extremes. The piano duo Glemser presents itself as an up-and-coming young ensemble with this selection of pieces that is so full of lightness, virtuosity and enthusiasm. The recording was made in the Steinraeber Haus Bayreuth on the concert grand piano E-272. The CD can be purchased in all major shops, including the Steingraeber Haus Bayreuth. The CD was awarded the title “CD Of The Month” by the German piano magazine “PianoNews”. Franziska Glemser (born Leicht), born in 1989 in Ochsenfurt in Franconia, comes from a family of musicians, to whom she owes a versatility that has become rare in today’s musical life. In addition to the piano, she studied violin and formed a local piano quintet with her four siblings, who also played music. She also trained her soprano voice with her father, Professor of Singing. In all subjects Franziska has appeared as a soloist; In addition, she has been concertmaster of the Würzburg String Ensemble since 2004. She was admitted to the University of Music Würzburg as a junior student at the age of twelve, but only eight years later decided to take up the piano class of Prof. Markus Bellheim for the piano. Already in the following two years she managed to assert herself twice in a row in the Jütting Stendal competition and to earn a scholarship from the foundation. Various other honors such as the Deutschlandstipendium or the Lions Förderpreis 2012. In addition, she was awarded the Medal of Honor of the City of Epinal at the 2015 International Piano Competition Epinal (France). She is currently continuing her piano studies in the masterclass of Prof. Grigory Gruzman at the Liszt School of Music in Weimar, where she has already received her Bachelor of Music “with honors”. Her concert career has taken her to renowned venues and festivals such as the Bruckner-Haus Linz, the Schumann-Fest Bonn or the Philharmonic Hradec Kralové in the Czech Republic. For the upcoming season u.a. Ravel’s Piano Concerto in G Major is planned with the MDR Symphony Orchestra in Leipzig. Her wide-ranging artistic activities reflect the formative powers of her musical background. Franziska accompanies her father Arno Leicht in recitals, playing in the piano duo with her husband, the pianist Florian Glemser. This young piano duo has already established itself in recent years as a sought-after junior ensemble. With Jonian Ilias Kadesha (violin) and Florian Schmidt-Bartha (cello) she worked together in the Piano Trio with the Juillard String Quartet. In this occupation she won in 2011 the Fischer flat competition for chamber music. Franziska was an active participant in numerous master classes, ia. with Hamish Milne, Klaus Hellwig and Dimitri Bashkirov. Her pianistic preferences also document an artistic horizon that goes far beyond anything special and extends from Bach and Mozart to the sensitive-spun sound worlds of a scriabin. As a musician experienced in all fields of ensemble playing, Franziska is able to elicit emotional nuances and colors from this complex and filigree repertoire, which raise her piano playing far beyond the sphere of virtuoso self-expression. More and more, the young German pianist Florian Glemser (* 1990) is establishing himself in concert life. Invitations to piano recitals and appearances with orchestras took him to almost all renowned concert halls in Germany (Konzerthaus Berlin, Laeiszhalle Hamburg, Herkulessaal Munich, etc.) and in other European countries in halls such as the Wigmore Hall in London, Stefaniensaal in Graz or the Brucknerhaus in Linz. His concerts are described by the press and the audience as experiences of special musical depth. Born into a family of musicians, he received his first piano lessons from his mother at the age of three. Already seven years later, he was selected to continue his musical education in gifted students at the Hochschule für Musik Würzburg with his father Bernd Glemser. He gave his concert debut at the age of seven, his orchestral debut in 2007 with the Philharmonic Orchestra in Würzburg as soloist of George Gershwin’s “Rhapsody in Blue”: a coincidence that could not be more fitting. Florian Glemser, an avid jazz fan, made a name for himself as a jazz pianist in his youth. He won the Soloist Prize of the Jazz Initiative Würzburg and toured Europe with Big Band. With the beginning of his studies, he finally decided on a purely classical career and was able to win numerous international prizes as a soloist and received scholarships from the Studienstiftung des Deutschen Volkes, the Hans and Eugenia Jütting Foundation Stendal and the German Foundation Musikleben. Chamber music and lied accompaniment decisively shape Glemser’s artistic self-image and play a significant role in his concert career. He regularly plays piano with his wife Franziska Glemser. His chamber music activities in various formations led to competition wins, radio recordings and concerts at home and abroad. The versatility of his interests is also reflected in the breadth of his repertoire. But he feels a special inner connection to the composers Johann Sebastian Bach and Robert Schumann. Robert Schumann is also dedicated to his 2017 debut CD “Schumann” (Ars Production), in which he embarks on an interdisciplinary journey of discovery, listening to Schumann’s dialogue between literature and music. The recording was enthusiastically discussed by several leading German media and the musical trade press (including DER SPIEGEL, Tagesspiegel, Crescendo). Since his youth Florian has been teaching Glemser. The educational activity has played an important role in his life for 15 years. As a result, in 2016, at the age of 25, he was selected as a full-time lecturer for the Berufsfachschule für Musik in Dinkelsbühl, where he has since been preparing study aspirants for university studies.